Chiropractic fills a very unique niche in the health care system. That’s why being a chiropractor in Overland Park is the greatest job! Every day we get to help children, adults and athletes feel better and function better through natural means. It’s exciting to be part of a growing industry that will only continue to grow as more people experience the benefits that chiropractic has to offer. If you are not familiar with chiropractic, please take a moment to review our site. You’ll find answers to many of the questions you may have about what chiropractic is and what a chiropractor can do for you. 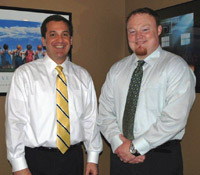 When you’re ready, give our Overland Park office a call to set up a consultation with Dr. Swickard or Dr. Fitzgerald. We look forward to meeting you and helping you reach your healthcare goals. Providing Overland Park and Johnson County the very best in Chiropractic care!